A lady was chased by a cow while wandering along, taking photographs. In trying to evade the animal, she tumbled a short distance into the stream below, injuring her knee. Her partner, who was in the village, was quickly contacted and he then raised the alarm. 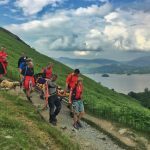 A couple of local team members were soonon scene, followed by the Team from Keswick. The casualty was treated and given analgesia, before being carried to the ambulance which was waiting in Rosthwaite for onward transport to hospital in Carlisle.